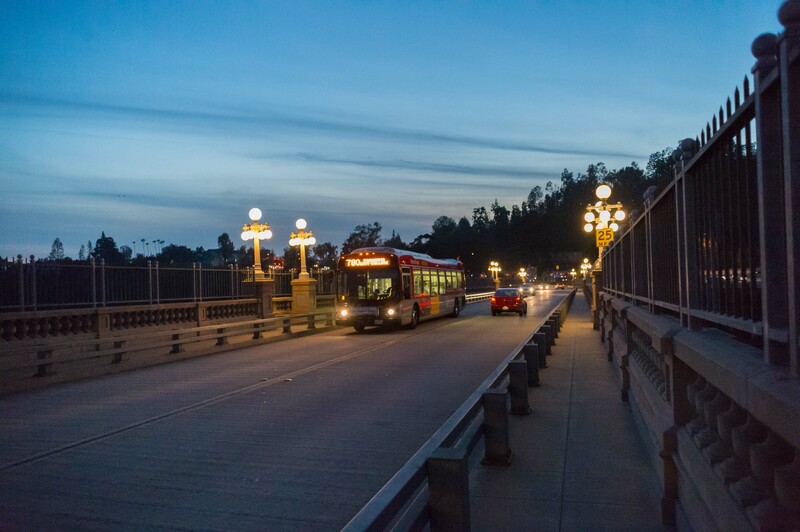 The Colorado Street Bridge in Pasadena last month. Photo by Steve Hymon/Metro. In the first four weeks of the Gold Line extension of Azusa, the number of “taps” at the new stations grew from almost 4,000 in the first week to nearly 5,000 in the fourth week. A Metro survey of 654 riders conducted March 22-24 also found 57 percent of the new riders who boarded at the new stations were bound for Pasadena and 29 percent going to downtown L.A.
Perhaps that shouldn’t be a surprise: a Pasadena official tells the Trib that the city has 110,000 jobs with 60 to 75 percent of employees living outside Pasadena (which has a population of about 140,000). About rider satisfaction: one third of all respondents said they thought more parking was needed at stations (in particular the Azusa stations) and one third of all comments were about wanting longer trains and more frequent trains. As my colleague Anna wrote recently, Metro has more new light-rail vehicles on order and they will be added to the Gold Line fleet after they are delivered and adequately prepared for service. As for train frequency, Metro continues to evaluate ridership with changes possible in the future. Really interesting read on efforts to figure out and assemble a digital map on the microbus system. Quite unlike rigidly-managed bus routes in American cities, the microbuses are much more informal and pretty much anyone with the right kind of vehicle can start their own route. As for routes, there are estimated to be about 1,500 of them serving 14 million riders. That’s in addition to the busy Mexico City Metro (the subway) and the Metrobus BRT. Mayor Rahm Emmanuel pledges to add 50 miles of bike lanes that are protected from car traffic over the next three years. Regular bike lanes are often good — but let’s face it, you have to get used to only having a line of paint between you and a really big piece of steel. It’s only a four-block stretch, but officials say it’s a stretch where buses and traffic tend to get bogged down. So it’s interesting to see if this kind of smaller, strategic approach can improve bus service — and, if so, will other agencies follow suit? The SGV Tribune article about the Gold Line riders mentions “a four-week survey not yet released to the public”. Apparently that survey has been distributed internally within Metro. Are you authorized to release the survey to your faithful readers? I’m not surprised that more than half of the riders from the new stations get off in Pasadena, or other stations before downtown. I expect that the longer trips from the SGV to downtown are still better served by the faster Metrolink service, in spite of the lower service frequency and higher fares. I suspect that the shortage of parking at the new stations is also discouraging Metrolink riders to switch to the Gold Line. Did the survey ask what modes of transportation the riders on the extension used previously for trips to the same destinations? What I have from the survey is basically what’s in the SGV Trib story and/or this blog post. I’ll add one nugget about how people made this trip before the Gold Line opened. Keep in mind it was a limited survey of 654 riders. Interesting but as I wrote to you in an email, perhaps early to draw firm conclusions. I am probably one of the 654 riders as I recall taking the survey. I am also one of the 29% to go to DTLA. I think Metro will see a reduction in the usage in the coming months unless they take some action. There are 3 major factors contributing to the rising frustration among commuters. 1. Parking at new stations especially at APU and DT Azusa is an absolute mess. No street parking at these locations (Azusa just posted signs to not allow gold line commuters to park on the residential streets) further exacerbates the problem. And no, its not possible for everyone to walk, bike, uber to the train station everyday…not everyone is that lucky. 2. Overfilled trains during peak hours: Its impossible to even board the trains on certain stations, and on the trains themselves people are literally squished. There is a lawsuit waiting to happen IMHO. 3. Timeliness of service: Trains (at least during peak hours) are rarely on time, adding to the crowds and further delays. I don’t even know how you enforce no-Gold Line specific parking restrictions on public property, short of putting time limits. If you want to park on the street find a roadway without time limits on it. The streets near the homes at APU/Citrus are private and permits have been required to park there for some time. As long as we’re talking about ridership, the data for the new NoHo-Pasadena Route 501, which opened the same week as the Gold Line extension, shows an average of 511 daily riders. That’s absolutely correct – it might just be a deterrent. There are no parking permits for resident parking…at least yet. They really need to do away or limit the 3 hour parking constraints within the structure. I think the new riders would be even higher if not for parking and crowding problems. Can as say as long time Metrolink rider who would love to switch over, but Azusa parking is a problem. Irwindale is full too now. Azusa downtown has a big structure but only a section of it is for gold line. Curiously, there are lots of spaces for 3 hour local parking that remain empty all day in it, while people scramble to find street parking. Now there are signs on nearby streets warning against gold line parking. It’s so weird; why wouldn’t they think so many people in the SGV would want to go to this, which is cheaper than Mlink and has way more trains leaving during the day and longer hours? It should be no contest. If you live anywhere between Alhambra and La Verne this would be a much better option. I live in San Dimas and the buses don’t really help so I need to drive there, I can do it in 15 minutes( about what i would need to go to Mlink anyway) but then I have to search for parking. Going to the ones past the 605 defeats the purpose too. If they fix that then they can take a ton of business from Mlink and the SB line which has many problems of its own. Taking business from Metrolink does nothing for Metro, because Metro funds Metrolink so there is no benefit. Steve: Thanks for the update on the Gold Line data for people using the new stations. You listed a lot of previous modes that were used before the extension (e.g. drive alone, bus and Metrolink), but you didn’t list the Gold Line itself, i.e. passengers switched from accessing the Gold Line at an older station for one of the new stations. I assume that there were a lot of passengers who stopped parking at the SMV station and switch to one of the newer stations, given the reports that that parking lot is only half full since the extension opened. Of those surveyed, 29 percent said they were existing riders (used the line three times or more weekly) and 71 percent said they were new riders. Steve said that “the number of “taps” at the new stations grew from almost 4,000 in the first week to nearly 5,000 in the fourth week”. This indicates that ridership on the Gold Line is increasing, not decreasing as the naysayers are naysaying. Also, “5,000 taps” indicates that the new segment of the Gold Line is nowhere close to capacity, even with two-car trains at 12-minute headways. (For comparison, the Expo Line gets over 7,000 daily boardings at the 7th/Metro station alone, with a similar level of service as on the Gold Line extension.) I’m not doubting that some Gold Line trains are packed to the gills, but that crowding problem likely has more to do with the schedule adherence problems than with a lack of capacity. Lisa: If you time your travel you can catch a Gold Line train that doesn’t come from Azusa, and therefore has seats available. Of course this assumes that Metro does a good job of schedule adherence. It is not the riders’ responsibility to overthink this and accommodate Metro. It is the other way around. The point is the trains from Azusa have no seats which is a disservice to the public that funds Metro. This may result in reduced riders from Pasadena. Lisa: No, it’s not your responsibility, but you have the opportunity to be an informed consumer to improve your chances of finding a seat. Riders on the Blue Line have been doing this for decades, as only half of the peak period Blue Line trains go all the way to Downtown Long Beach. I’m sure there are plenty of these riders who have studied the schedules and learned when to arrive at their stations to improve their chances of finding a seat. I provided input to Metro regarding my Gold Line experience by leaving my comments, which I hope are helpful to Metro. Moderator: the troll needs to go.